LinkedIn has really been putting in some extra work to catch up with its more fashionable peers for a while now, with the massive ongoing Microsoft takeover lending added impetus to this drive. We covered their huge overhaul a couple of weeks ago, one that included layout and messaging revamps, and a new algorithmic news feed. The site appears to be trying to become one of the cool kids by fitting in, which is a good start at least. 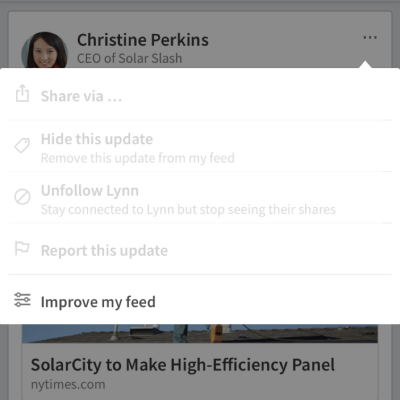 Building on the algorithmic news feed implementation, LinkedIn is now adding extra options so that you can manually tweak your feed. This allows you to finetune what exactly you want to see, providing a further layer of customisation over the algorithm. It seems like they want it to become your Facebook feed for professional news and connections, so you can scroll aimlessly through an impeccably personalised feed of various lists of 5 Recipes for Instant Business Success instead of 5 Times these GIFs of Ron Weasley Perfectly Summed Up Our Whole Lives to this Point. Even the most dedicated of readers isn't going to be able to get through all the clickbait shoveled their way in a day, so if you spot a diamond in the rough but you don't have time to read it because you're too busy driving down the motorway making connections, you can save it for later. I feel that the button used here is a little small, but jokes aside, this is definitely a welcome feature for pocketing any little Ron Weasleys that might wander cross-platform. 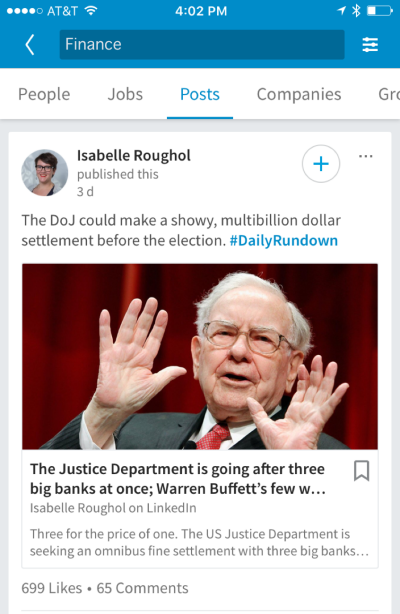 LinkedIn have revamped the mobile search bar, allowing more efficient searching for topics, including the use of hashtags in posts and searches. The function is also split, so you can search for posts, jobs requiring certain skills or people with those skills. Or Ron Weasley. So overall, some solid new features to a mobile app that people are spending more and more time on. 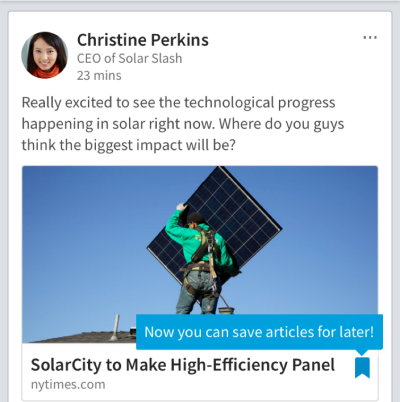 LinkedIn definitely seems to be focusing on the content side of the network a lot more, reflecting the ongoing push by the majority of social networks towards acting as both a social interaction tool and a source of customised content for their users, driving up time spent in-app. Everyone really is being drawn in by the irresistible forces of algorithm-driven content, and our appetite for it seems endless.